A cute succulent with pink/red flowers. Lies low to the ground. Whole plant is edible. In Ice Plant family, contains lots of water, great fire and weed barrier. Freeze leaves in plastic bags to break down leaf cells. Release alkaloids by drying 3-4 days. Antidepressant, helps addictions, smoking. 633 Aizoaceae Aptenia cordifolia 634 Pinaceae Pinus patula 635 Iridaceae Gladiolus communis 636 Piperaceae Peperomia sp. Bolli blue elderberry Aizoaceae Iceplant Family Aptenia cordifolia (L.
Red apple iceplant, Aptenia cordata, is only hardy to zone 8, but it would be worth growing as an annual ground cover in colder climates. Otras especies introducidas en las lomas son: Casuarina equisetifolia (Casuarinaceae), Aptenia cordifolia (Aizoaceae) y Arundo donax (Poaceae). Effect of irradiance on growth and development of Aptenia cordifolia (L.
1996), baixa frequencia de quiasmas em especies de Lycopersicon (Haroun, 1996), segregacao irregular de univalentes em especies de Pennisetum (Dujardin & Hanna, 1984) e em Aptenia cordifolia (Pagliarini, 1990). 4 Clip: Groundcover Red Apple, Aptenia cordifolia, a trailing South African native, is a relative of the ice plant which blooms fabulously in spring then becomes almost unattractive in the heat. Especies invasoras historicas detectadas: Aptenia cordifolia, Carpobrotus edulis, Nicotiana glauca. Aptenia cordifolia 'Red Apple' may be the most popular choice for this purpose, but it's by no means the only one. What makes this plant amazing: Anyone who has lived in Southern California has seen aptenia - those clusters of smooth succulent leaves capped with small reddish flowers. REGION PRESENCIA TAXON DE ORIGEN EN CANARIAS AMBIENTES COLONIZADOS Abutilon Peru L, C, T, G, Cunetas de carreteras grandiflorum H, P en el piso termomediterraneo Acacia cyanophylla Australia C, T, G, P Fondos de barrancos, cunetas de carreteras, a baja altitud, a menudo en los dominios del monte verde Agave furcroydes Neotropical G, C, F, L Ambientes ruderales aridos Albizzia dystachya Auatralia C, T, G Claros de monte verde Aloe vera Capense L, F, C, T, Muros de piedra y G cunetas, a baja altitud Antirrhinum majus Mediterraneo H, P, G, T, Ambientes rupestres C Aptenia cordifolia Capense L, F, C, T, Setos de jardines, G, H terraplenes, etc. 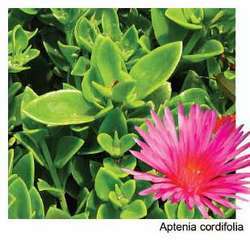 You might also consider red apple ice plant, Aptenia Cordifolia, which is one of the fastest-growing ground covers, but will require at least twice-weekly watering if planted in full sun in your area.